Bakerzin’s Artisan Cookies Impressed and Dazzles! 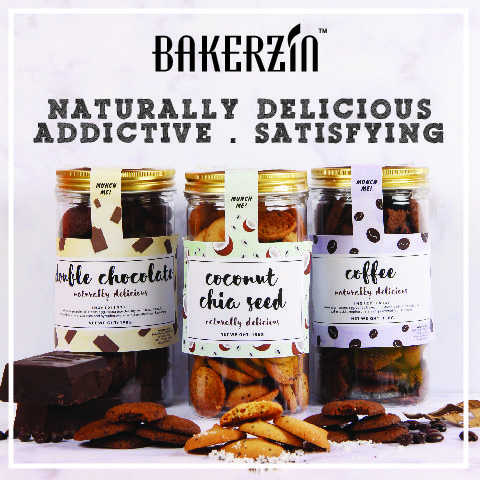 Wednesday | March 7, 2018	After this year sell-out Good Luck Cookies, Bakerzin re-introduces three popular flavoured cookies by popular demand, namely Double Chocolate, Cookie and Coconut Chia Seed flavoured cookies! Be swept head over heels with strong tones of flavours, highly accentuated to give each flavour a resonance, and be prepared for a third and fourth helping! All cookies are artisanally prepared and baked to perfection, the texture is crisp, crunchy and light! Now available at all Bakerzin retail outlets and online.